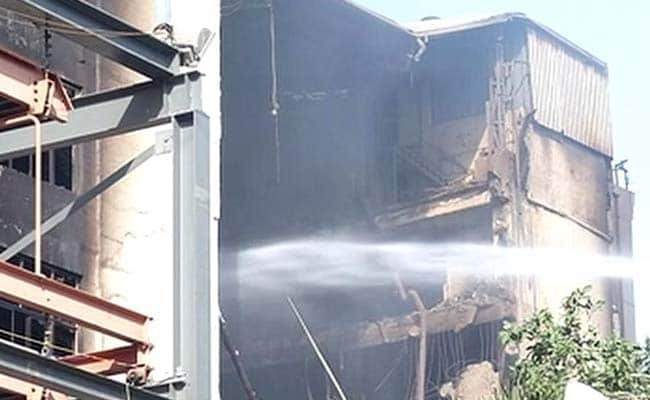 The fire at the Chennai Silks showroom was noticed around 5 am, police said. A major market in the heart of Chennai remains blocked off as a fire raged for the second day in a row at a large shop which sells textiles. No injuries have been reported; 12 people have been rescued using hydraulic lifts. The top five floors of the building that houses Chennai Silks caved in this morning because of the intense heat. Thick smoke was soaring into the sky. The fire began at 4 am yesterday in the seven-storey building, reportedly as the result of a short circuit. Declaring the area unsafe, the police have cordoned off the busy T Nagar which has forced the shutdown of other shops and offices in the area for two days. Zero visibility was reported in the area. The fire began Wednesday morning in the 7-storey building, reportedly due to a short circuit. Over 150 fire fighters are trying to put out the flames. More than 100 water tanks have been used, but narrow roads are making it tough for emergency equipment to be brought to the spot.